I have always enjoyed trying new things. I also love the adorable handmade products that come from Etsy. But there are so many things to choose from on Etsy, it can be difficult to pick just one thing. Plus you can be searching for hours. What if you could try ten, twenty or even thirty Etsy products for just one low price? What if you could sample a variety of tasty treats, unique handmade gifts, and self indulgent beauty products, and have them all shipped to your door every month? Sounds like a dream doesn't it? Well, it not! Its a very real service provided by Out of the Box Sampler. They work with hundreds of different Esty sellers and send you a box of samples products every single month, all for only $23.95! I was lucky enough to receive the November Harvest Box. I was no less than flabbergasted at all the products that came in the one box. See the picture above. There are too many to list each one individually, but I'll give you a general idea. There were several different kinds of soaps, some in regular squares and some in cute fall designs like leaves and pumpkins. There were skincare samples, soy wax melts, teas, and lip glosses. Some of the more unique items were a candy corn pin and a cupcake in a jar. Most are sample sizes, but there were a few full size products included! All in all, the number of products and the great variety is well worth the charge of $23.95. Its a great way to get to know new companies without spending a fortune. It would also make a great gift for anyone who loves hand made luxuries of all kinds. In addition to their regular monthly box, Out of the Box Samplers usually offers a bonus box. In November is was the Coffee, Tea, Latte and Me, which gave you a taste of all things drinkable. 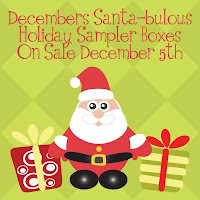 The December box is called the Santa-bulous Holiday Sampler. You can see all the sponsors here. I like this company because there is no obligation to have something shipped every single month. You can order when and if you feel like, and have a few extra dollars to spend. In addition to ordering sample boxes, you can also cash in on coupon codes. And if you happen to sell on Etsy, you can send in some samples of your own, and get your shop noticed by tons of people every month! I love the whole scenario of Out of the Box Sampler. Its the perfect way to bring together small businesses and the people who love to buy handmade products! 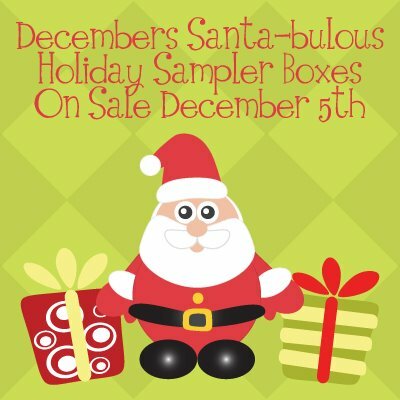 One lucky winner is going to receive a December Santa-bulous Holiday Sampler! To enter, just fill in the Rafflecopter form below. This giveaway will end on 12/17/11. The winner will be notified via email and will have 48 hours to reply. Thanks again to Out of the Box Sampler for offering this fantastic prize. im most interested in angelascandles. The cubby cheek bourique looks cute that may be fun! I would most like the item from Indian Mound Fossil and Stone. I'm most excited about the Blue Mountain Soaps. I am excited about Chubbie Cheeks Boutique! I'd love to see what Porkchoperie has to offer! Candy cake truffle sounds great!! Nubia's Edible Florals looks yummy and pretty! I think Shustrings shop looks great with all those awesome soaps! ohhh the peanut brittle!!! yum! Ken's Airy Crunch Peanut Brittle is the one I'm most excited about. I'm really excited about the stuff from Gizmo Greetings! oooo the Clarks Creek Candles and the Ken's Airy Crunch Peanut Brittle!